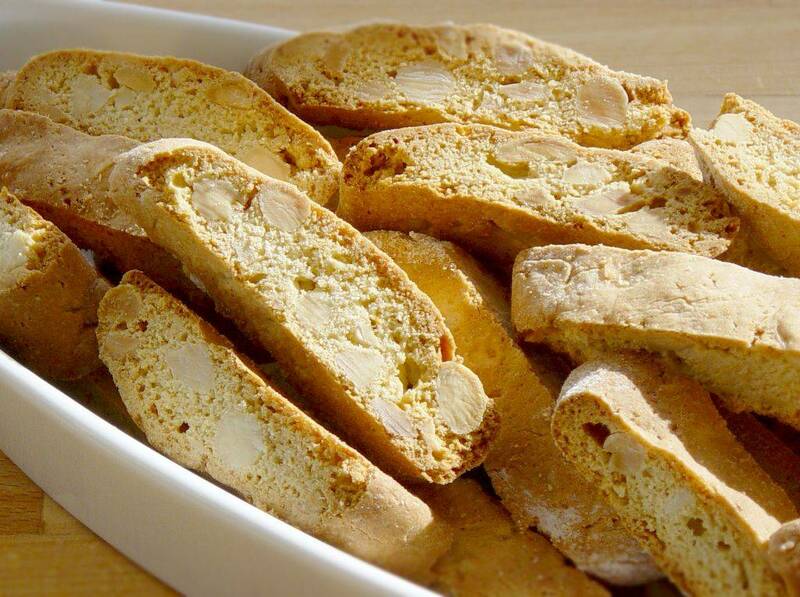 Biscotti means "twice baked" and is in fact a general term for cookies. The name for this version with almonds is in fact Cantucci and comes from Tuscany. Boil the almonds a few minutes and deskin then them. Roast the almonds for 15 minutes at 200°C (390°F) to dry them out. Beat the wet ingredients separately until the sugar is dissolved. Knead the dry and wet ingredients in a bowl. Roll each portion into a "sausage" that is as long as your baking pan. Put them on the baking pan and press them flat to approx. 2 ½ cm (1 inch) thickness. Bake them once in the oven at 175°C (350°F) for approx. 25 minutes. Take them out and let them cool down a few minutes. Bake again until golden. About fifteen minutes. Turn them over once or twice so they get evenly golden on all sides.